The Taiwanese manufacturer behind Apple's product line may open up shop in LA and Detroit. Foxconn, the company best known for its worker suicide rate, is considering opening up new factories in Los Angeles and Detroit. Why? Because that darn expensive Chinese labor is just draining all the profits out of Foxconn's manufacturing. 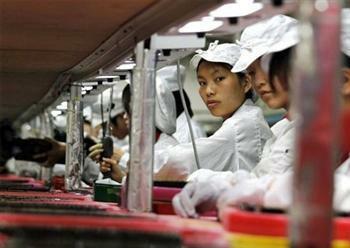 Foxconn wants to cut its costs, and thinks an American operation may be the way forward. Foxconn chairman Terry Guo has already announced a training scheme for US-based engineers. The scheme will bring the engineers to Taiwan, or China, to get a first-hand look at Foxconn's manufacturing methods. One of the benefits of the scheme, according to Guo, is that it will give the engineers a crash-course in the Chinese language. Guo is in talks with MIT to get this done. The US isn't Foxconn's only option. It already has eight factories in Brazil, and is putting $10 billion into Indonesia within the next five to ten years. However Guo has high hopes that his US protÃ©gÃ©s will return to America and set up facilities with automated equipment. Foxconn's change of perspective has a lot to do with its recent troubles in China. Investigations and audits, provoked by the high suicide rate and an explosion at its Chengdu plant, have forced new safety standards and higher wages at Foxconn's Chinese factories. That expense doesn't sit well with Guo, and so Foxconn started looking abroad for other places to set up shop.